As we clock into the Chinese New Year, anticipation for the annual Spring Festival Gala, or Chunwan, is mounting. 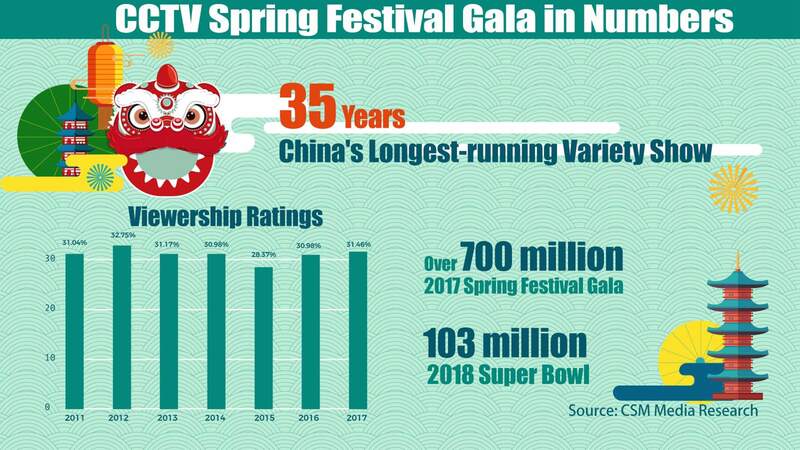 The gala, produced by China Central Television (CCTV), has accompanied generations since 1983. For a show that has survived 35 years, it seems to have fallen behind the pace of the times. But it remains watercooler TV. The reason? Chunwan has long been seen as a symbol for the family reunions that take place around China at this time of year. Whether you like it or not, it is there. The viewership ratings are huge. Chunwan is often introduced to foreigners as the Chinese equivalent of the Super Bowl. But the audience is several times larger. The 2018 Super Bowl drew around 103 million viewers while the 2017 Chunwan recorded more than 700 million, or 6.8 times more than the Super Bowl. Chunwan is a 4.5-hour epic variety show combining singing, dancing, stand-up comedy, skits, operas, acrobatics, martial arts and magic shows. The talent taking part does so not for big cash rewards, but for the chance to perform in front of 1.3 billion people. The gala has sent a number of artists into stardom in the past 35 years, and many have come back for repeat appearances once they have become household names. 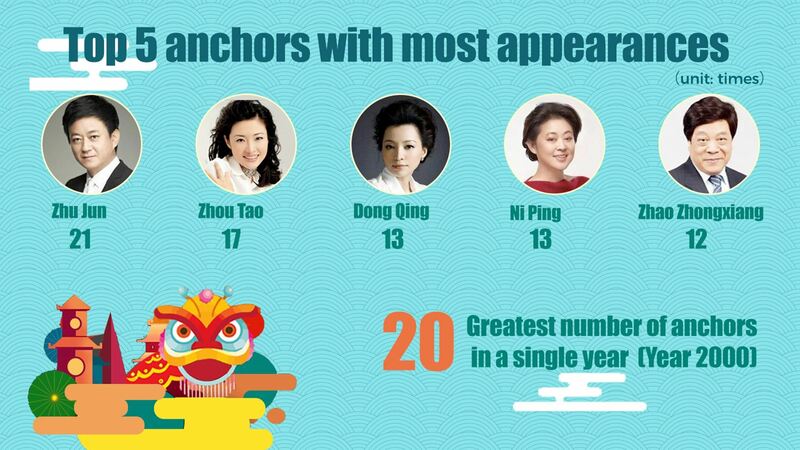 Four of the most frequently appearing stars are comedians – Feng Gong, Cai Ming, Huang Hong, and Zhao Benshan. The other two, Song Zuying and Cai Guoqing, are singers. 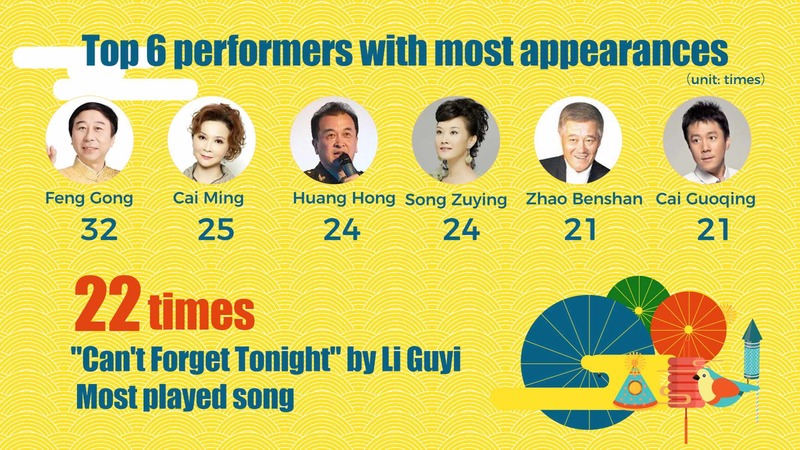 The most played song at the gala is “Can’t Forget Tonight” by Li Guyi. It was first sung on stage during the 1984 Spring Festival Gala. This year, veteran hosts Zhu Jun and Dong Qing will not be taking their positions on stage, which came as a surprise to many viewers. Zhu has hosted 21 editions of the gala, while Dong is the third most frequent host, with 13 appearances – tied with her predecessor Ni Ping. In 2000, the first gala in the 21st century had 20 anchors in total, a record for the show. To attract more young viewers, the producers have never stopped innovating. 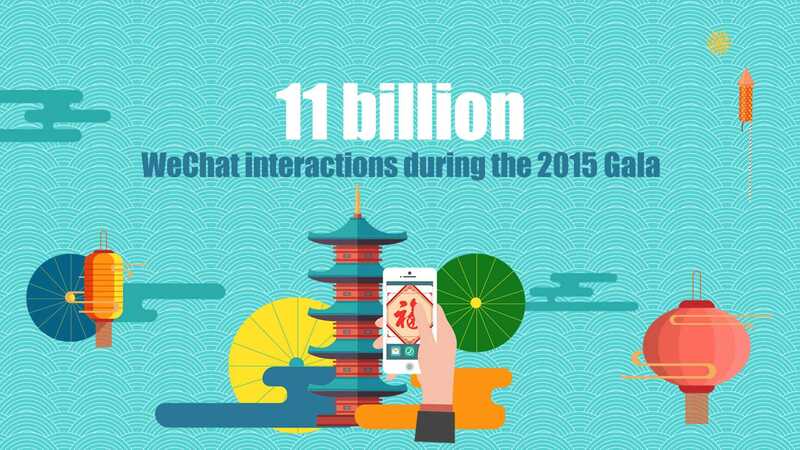 In 2015, they teamed up with popular messaging app WeChat to enable online interaction with a QR Code on-screen during the show. More than 11 billion interactions were logged. And last year, the gala established four sub-venues in four cities in the country’s north, south, west and east to welcome the Chinese New Year together with the center stage in Beijing. 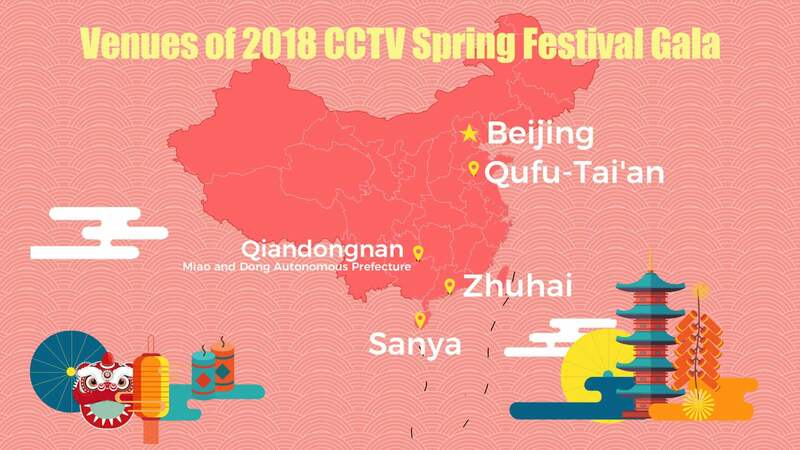 This year, CCTV has continued with the multi-venue plan. The four sub-venues are located in the cities of Qufu-Tai’an, Zhuhai, Sanya and Qiandongnan Miao and Dong Autonomous Prefecture. In the past couple of months, paparazzi have been stationed outside the CCTV building sniffing out information on who will be attending the big event. So who will appear during the live show? Guess we can only wait and see when it airs live 8 p.m. BJT on February 15.